The Scirocco 16v was a short lived high performance sports coupe brought to the USA starting in 1986 1/2. The Scirocco MK2 actually was produced and imported to America starting in 1982, but it all ended in 1988, for the USA at least. Canadian buyers were blessed until 1989, and the very lucky Europeans held on until 1992. The Scirocco was ultimately replaced in Volkswagens' line-up by the Corrado, which itself was relatively short lived. Unfortunately, many Americans couldn't reconcile a real sports coupe with a VW emblem on the grille; twice. When it was availble, arguably at the peak of it's performance potential, the Scirocco 16v awarded drivers with power and VW practicality. The Scirocco 16v raced from 0 to 60 in a mere 8 seconds, very powerful for the era. The windtunnel designed bodywork helped slip the car through the air, and reduce rear lift by a reported 30 percent. The exterior was a 'love-it' or 'hate-it' affair. If you liked a deep chin spoiler, side skirts, rear valance, wheel arches, colored bumpers, all body colored; then this car was for you! Do not forget the rakish Fuba, first used on the VW line for the Scirocco 16v, and now reused on almost all VW's produced today. It's even been copied by non-VW makes! No wonder, it just oozes speed. It was the engine, that sweet revving 1.8L, CIS-E (KE-Jetronic) fuel injected, 16 valve four cylinder, promised and delivered 123 stock horsepower at the end of the crank. Previous iterations of the 1.8L engine put down 30% less HP, the 16v was VW's ultimate 4 banger. This would be the only time the A1 chassis received the 16v engine from the factory. Slowing the fairly light A1 chassis down (heaviest variant being the Scirocco 16v at around 2250-2300lbs) was a delight due to the factory using four-wheel disc brakes. 10.1 inch discs up front (the hottest discs from Wolfsburg until the Corrado came out), and 8.9 inch (erronously stated as 9.4) discs at the rear. Outside of the (odd) Quantum, this was also a first for the VW line, and also the only time the A1 chassis got four-wheel discs from the factory. Reports of the time indicate braking performance was fantastic when compared with other cars of the day. The cars' running shoes consisted of tires on 14x6 teardrop alloy wheels, a much copied design, sized at 185/60. Very respectable for the time again. The 16v Scirocco was also equipped with uprated spring rates, and slightly larger front and rear anti-sway bars then previous generations. The front was sized at 16.5 mm stock, while the rear was 20-21mm. All sound too good to be true? It's almost too late to find pristine examples that people are willing to part with, so good luck! (I do know you'll never get mine! :-) ) Just sit in the plush stock Recaros, stare at the 140MPH speedo (or 160MPH in some cars! ), stir the 5 speed close-ratio box (sure, it's buzzy at high speeds, but it gets there damn quick! ), turn the key and delight at the twin cam sound, ease off the clutch, and motor down the road in what is bound to be a historically significant and collectible sports coupe. See you on the road! The VW 16v head was first used in the Scirocco as a test for the Golf and to give the sport car some, sport! The Scirocco is a low production car compared to the Golf so it is not as easy to find the history on the Scirocco 16v. True the MK2 Golf 16s (16v Oettinger) was sold as a sport rocket to compete against the 205's and other French bombs of the day but a few Sciroccos were built and tested in 1983. The VW 16v head had several revisions. The production was delayed while the engine was made reliable and at the same time cost-effective to produce. The final version of the 16v is a narrow double-overhead-cam design, with sodium-filled 28-mm exhaust valves arranged almost in line with the block,and 23-mm intake valves placed 25 degrees to the right. The pistons are cooled by an additional stream of oil sprayed underneath toward the piston head, a feature automatically activated after the oil pressure drops to 28 pounds. I do not think that the European public got the Scirocco 16v until late 1984 or 1985 in any volume and still the over all volume on the Euro version Scirocco 16v was low. For the US model more changes were needed. The Bosch KE fuel injection system replaced the old K injection (which was purly mechanical), with a knock sensor, Lambda sensors, and a catalytic converter, which were added so the 16v could be sent to the US. In 1986.5 VW started importing the "16v" to the US. The US version had the painted "GTX" body kit but the Euro version still had the black body kit until 1988. The Euro version's body is slightly different than the US version too. The door's do not have the extra US side impact bar and the stamped sheet metal rear of the car has different bumper cutouts and no lip for the US license plate. The Euro version came with the bottle cap wheels and not the teardrops like all the US cars had. Euro models included the 16v, the 16v GT and the 16v GTX. The car could be order with several option packages in Europe. The US Scirocco 16v had just one model name but the options differed from a base version with no power windows or sunroof to the full feature set and even heated seats. After a short time the 50mm intake was recalled and a 40mm was used to replace it for better low end torque. The 160 mph speedo was (mostly) changed out for the 140 mph speedo for the 1987 models. The 1988 version has several small detail changes that are difficult to see at first like the logos on the glass that are different and some of the trim around the doors is different as well as the instrument cluster. You will note the upshift LED is missing on the '88. In 1985 the Corrado design project was still called the Scirocco 3 unofficially and it was being designed with the VR6. The Corrado name was decided on after marketing found that VW could not remove the Scirocco price point from the market and the Scirocco 3 (Corrado) was way too expensive. 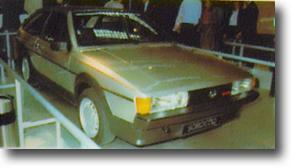 I have a picture of an early Corrado concept model with the Scirocco badge on it. The Scirocco 16v was faster off the line than the Corrado 16v. The Corrado eventually got the VR6 and was a better top-end car but was too expensive and heavy to be a real replacement for the MK2 Scirocco. One other thing that was lost on the Corrado was the direct linkage shifting. Cable shifting was added and I think that this made the Corrado less fun to drive.